Due to some behind the scenes technical difficulties, our series of posts on the campaign finance ecosystem of the 110th Congress have been unavailable. I am happy to report that we now have everything restored. We thought it would be nice to repost the visual above in light of recent decisions such as Citizens United v. Federal Election Commission. The Citizens United case has justifiably generated a significant amount of media / blogosphere coverage. For those not familiar with the Court’s decision, there is a full roundup of analysis available at SCOTUS Blog and Election Law Blog. For those interested, our original post is offered here and the documentation for the network creation and data collection is here. Also, there are variety of other related posts related to the 110th Congress available under this tag. 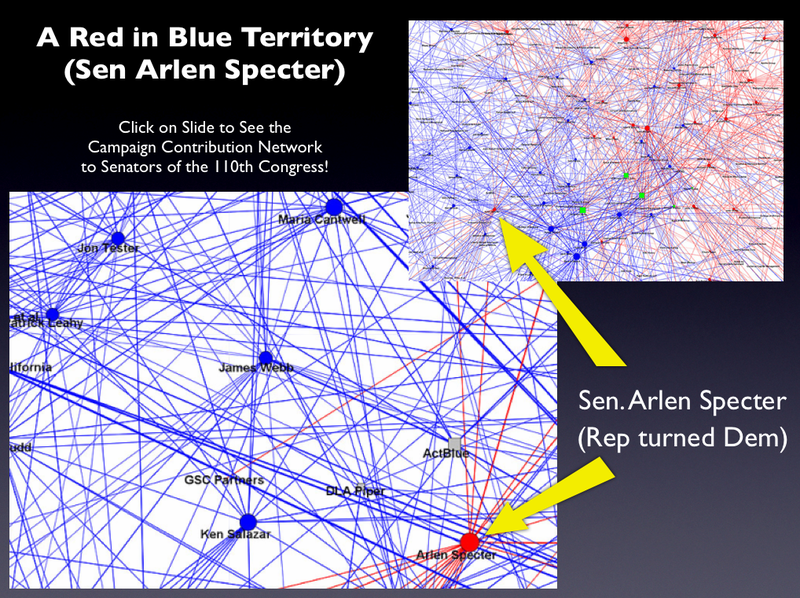 This is a repost our previous Senators of the 110th Congress Campaign Finance Visualization. Last week we highlighted one specific element of the graph (i.e. Senator Dodd and the TARP Banks). Now, we wanted to bring the full graph back to the front of the page for your consideration. Here is the content of the old post with a few small additions…. “As part of our commitment to provide original content, we offer a Computational Legal Studies approach to the study of the current campaign finance environment. 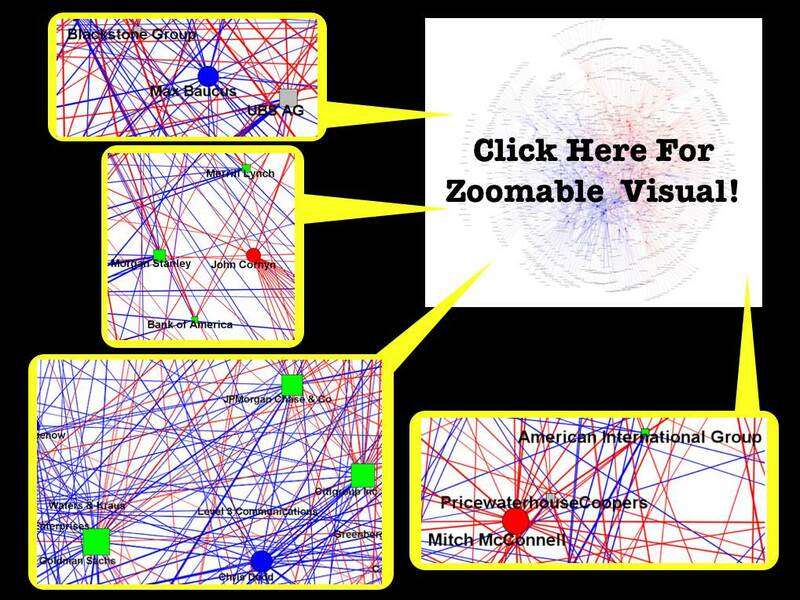 If you click below you can zoom in and read the labels on the institutions and the senators. 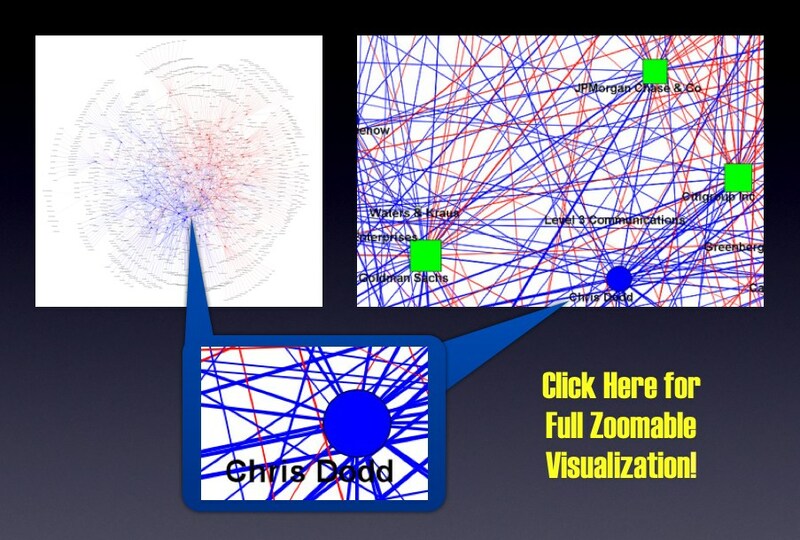 The visualization memorializes contributions to the members of the 110th Congress (2007 -2009). Highlighted in green are the primary recipients of the TARP. In the post below, we offer detailed documentation of this visualization. 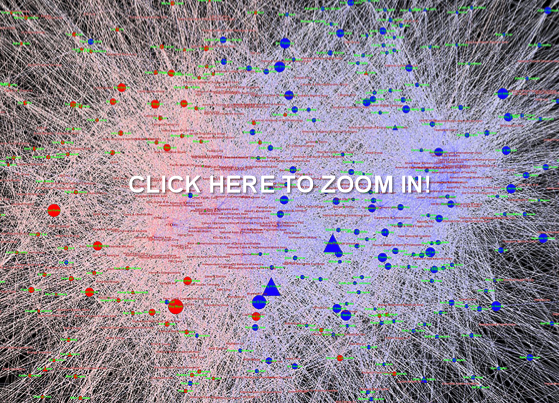 One Important Point the Visualization Algorithm we use does force the red team, blue team separation. Rather, the behavior of firms and senators produces the separation. In our previous graph visualizations of contributions to members of the House and Senate, there have been two types of entities: Contributors and Congressmen. This division manifests itself in the dynamics of the graph as well – Contributors give only to Congressmen, and Congressmen receive only from Contributors. A network with this property is bipartite, and there are a number of additional ways to represent the relations contained therein. One such representation is called the single-mode projection. In this simplification, only elements from one of the two sets (e.g., Congressmen or Contributors) are displayed. A relationship exists between two elements in the visual if they share a relationship with at least one member of the other group. For instance, both Bernie Sanders and Sam Brownback received campaign contributions from the the National Association of Realtors. Thus, the Congressmen both have a relationship with the same Contributor, and the simplest single-mode projection would represent this as a shared relationship between the two Congressmen. For more on this projection or other representations, see Wasserman and Faust (1994) or M. E. J. Newman, S. H. Strogatz, and D. J. Watts, Phys. Rev. E 64, 026118 (2001). As the Sanders-Brownback example above demonstrates, however, it is relatively easy to be connected in this representation. Thus, we enforce a threshold on the number of shared contributors for a relationship to exist – representatives must shared at least 10 contributors in order for a relationship to exist between them. It is important to note that different thresholds may produce different graphs. We have chosen this figure as it represents roughly half the number of major contributors to the typical representative. Obviously, alternative specifications are possible. In future posts, we may present different thresholds or normalizations. However, for now, we believe this is a simple but appropriate representation for the underlying data. Given the requirement of sharing at least 10 contributors with another member, the above visualization no longer contains every member of the House of Representatives. To observe the full graph, please see our first post on the contributions to the House. Interpreting this visual is very similar to previous visuals, and in many ways simpler. Other than points (1) and (2) below, again refer to our first post on the contributions to the House. (1) SIZING of the CONNECTIONS — Each Connection (Arc) between an Institution and a Member of the House is sized according to the amount of money flowing through a connection. Darker connections represent larger flows of money while lighter connections represent smaller amounts of money. 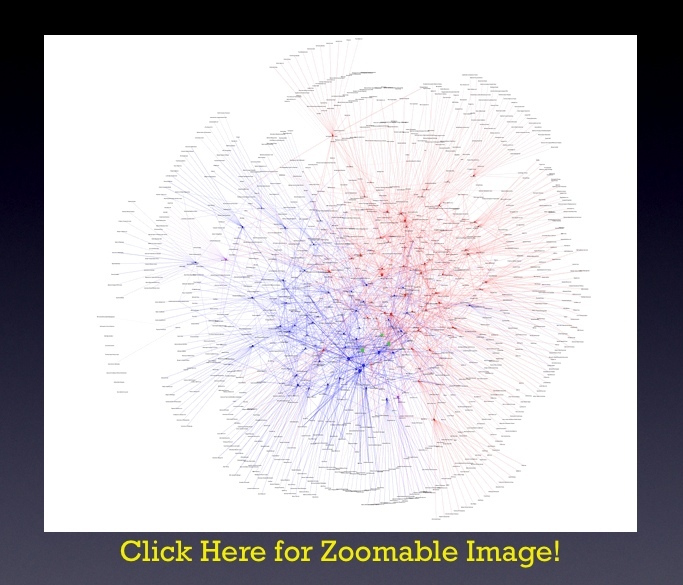 (2) COLORING of the CONNECTIONS — Each connection representing a shared campaign contributor from between members of Congress is colored according to partisan affiliation. Using popular convention, we color shared relationships between Republican Party members as Red, and blue for shared relationships between Democratic Party members. For relationships that span across the party lines, the color green is used. As part of our commitment to provide original content, we offer a Computational Legal Studies approach to the study of the current campaign finance environment. If you click below you can zoom in and read the labels on the institutions and the senators. 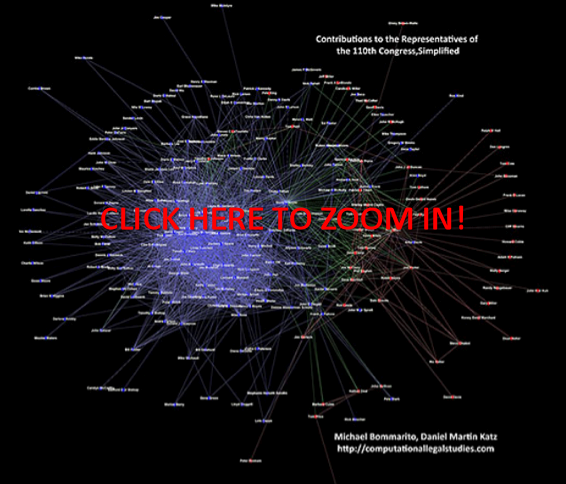 The visualization memorializes contributions to the members of the 110th Congress (2007 -2009). Highlighted in green are the primary recipients of the TARP. In the post below, we offer detailed documentation of this visualization. Three Important Principles: (1) Squares (i.e. Institutions) introduce money into the system and Circles (i.e. Senators) receive money (2) Both Institutions and Senators are sized by dollars contributed or dollars received (3) Senators are colored by Party. To view the full image, please click here. By Michael Bommarito and Daniel Martin Katz.